Posted on 21 June 2015. Retrospective, the memorial tribute to Paule Anglim (1923-2015), is one delirious jumble of a show. Hung salon-style and packed with 115 objects representing a substantial number of the artists she represented, it could easily form the template for a museum-length retrospective — should some enterprising curator rise to the task. Warning: It won’t be easy. Anglim’s tastes ran all over the map. Her choices were guided by instinct, not salability, and she backed those commitments with an uncommon loyalty. Which is why this show — a sampling of her massively influential 50-year career that ended on April 2 with her death — is essential viewing for anyone interested in art from 1945 to the present. fabric-and-wood sculpture by Michelle Rollman that posits two sets of animal hindquarters joined at mid-body and facing each other — a visual metaphor for things that can’t or won’t work. (One thinks of the U.S. Congress.) 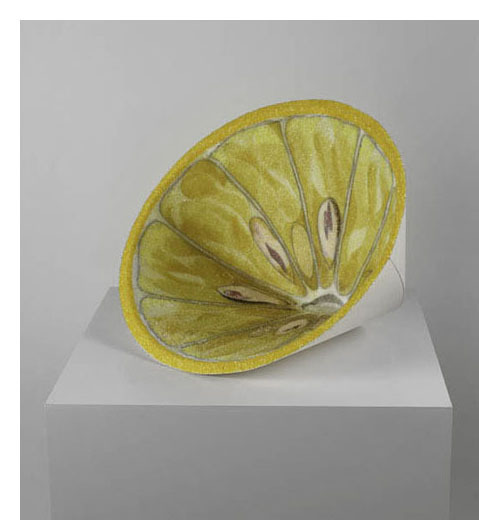 Wedge (2014), a blossom-like wood cone filled with yellow glass and epoxy made by Gay Outlaw, harbors allusions that shift uneasily between organic and kitsch. 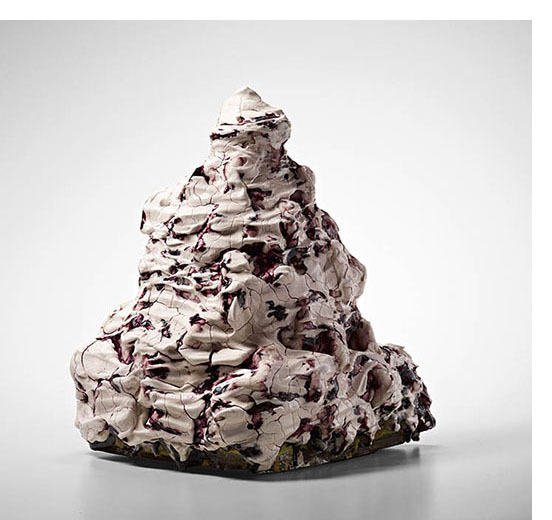 On a slightly higher pedestal, is Annabeth Rosen’s ceramic sculpture, MAHJAY (2015), a lumpy conical shape with a white confectionary glaze whose associations run to beehives, volcanoes and the early Egyptian tombs known as mastabas. Stranger still is the aorta-shaped plastic sculpture, Untitled #2 (2002) by Jon Paul Villegas that combines fabricated and store-bought hardware. The components, which recall plumbing fixtures, make for a Pop Surrealist take on anatomical models. This portion of the show also includes several excellent paintings. They include a 1994 piece, The Frogs (After Aristophanes) from Tim Rollins, reminiscent of the pattern-over-book-page works he made with South Bronx schoolchildren (the group known as K.O.S. ), and a luscious, big-hipped portrait by Judith Linhares called Mary from 2006. 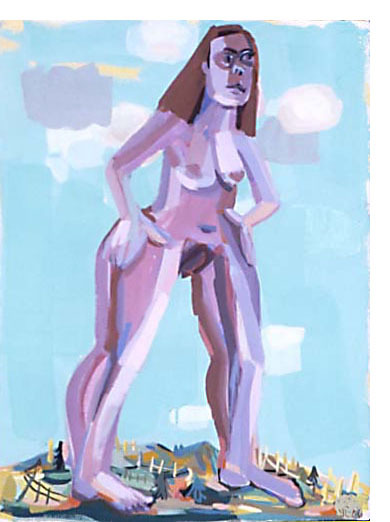 Rendered in zany-colored, slat-like strokes, she towers like a female Gulliver over a diminutive landscape, vividly reminding us that the artist was among those included in the New Museum’s Bad Painting show in 1978. Even bolder is the shot-through two-part volume, The History of the United States Since 1865 with a Few Missing Parts (2007) by Mildred Howard. The holes, made with a drill, bluntly refer to the violence sweeping America and also, more pointedly, to the exclusion of African Americans from official accounts of the Reconstruction era. stand out. Robert Stone’s untitled work from 2015 is a collision of geometric forms made of glossy pigment; it’s combed in different directions to form a relief painting that looks woven. Joshua Podoll’s, A Welcome End to Knowing #24 (2003), has at its center a large oval shape, abraded to reveal the warp and weft of the canvas. It’s surrounded by blurry leaf images, a contrast that turns the painting into something approaching a symbolist beacon. shades,rubbed raw to reveal the weave of the canvas. The only brighteners are three ragged, pale-blue, vertical lines – the sole vestige of his earlier works. It’s one of the subtlest most powerful paintings in the show, and impossible to appreciate in reproduction. Another of my favorites, in shadow from (2011), from David Hannah, appears on the opposite wall. 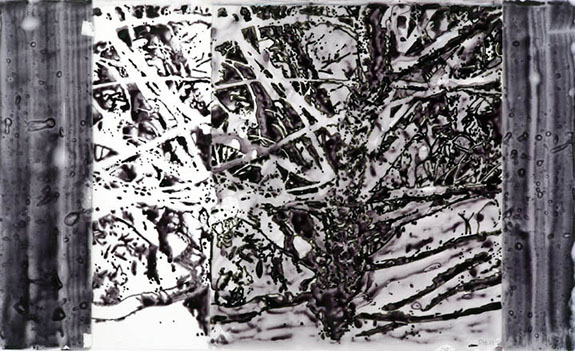 Its shadow shapes, made with ink on semi-opaque plastic, recall a multi-layered photogram. 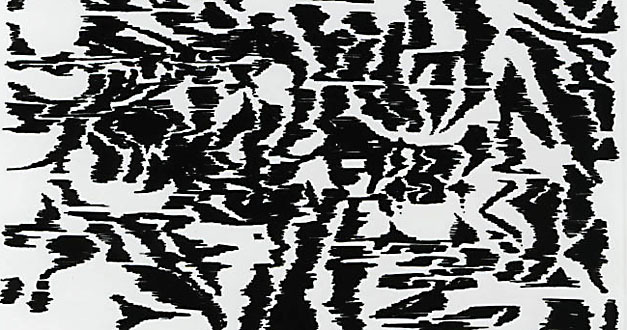 It’s an apt counterpart to a nearby Bruce Conner drawing, UNTITLED, MAY 20, 1975 (1975): a shimmering black-and-white moiré pattern unlike anything seen in the trove of paper works recently displayed at the San Jose ICA. David Hannah, in shadow from, 2011, shellac-based ink, collage on plastic, 17.5 x 29"
Lastly: On the same wall as Hannah, opposite the freestanding one on which Conner’s drawings appear, you’ll find the artist who’s been called the godfather Bad Painting: Charles Garabedian. He’s known mainly for eccentric Neo-Expressionist figurative works. 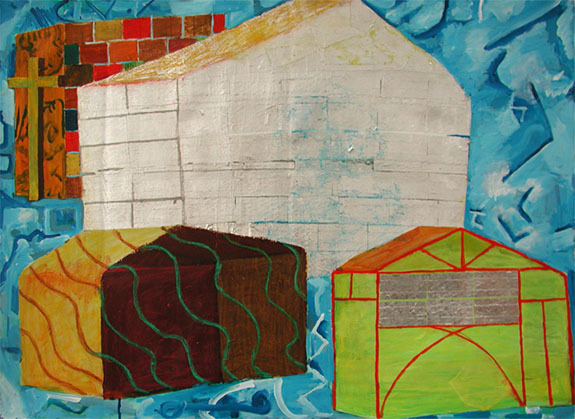 This one, Yellow Temple (2007), is of a rural landscape populated by cinderblock and wood shacks. Painted in Caribbean colors and patched with aluminum foil, it pulls in light and reflects it back at you all at once. From a show like this you can wring countless such conjunctions. I left feeling exhilarated and exhausted, convinced that with repeat visits I could write several reviews, each focused on an entirely different group of artists than those I’ve discussed. Retrospective is as nuanced and as unruly as the tastes of dealer it memorializes. On the strength of the individual works and the history they encompass, it could easily turn out to be the most important exhibition of the year. “Retrospective: Paule Anglim (1923-2015): a memorial exhibition commemorating 50 years of support and collaboration” @ Gallery Paule Anglim through June 27, 2015. Learn more about Paule Anglim. 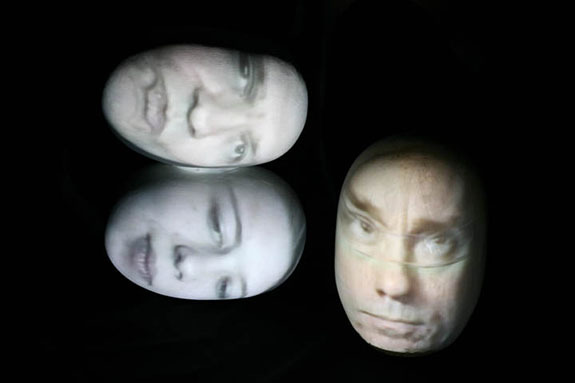 Listen to gallery director Ed Gilbert's eulogy, delivered May 31 @ SFAI. Photos: Courtesy Gallery Paule Anglim. Wonderful review. So many good women. Loved how you started out with Annabeth and Gay. Thank you for the tribute to the tribute.